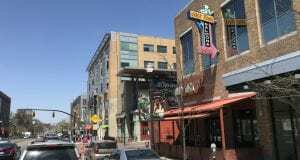 INDIANAPOLIS – It wasn’t pretty, but it didn’t need to be. In the month of March, synonymous with the adage of “survive and advance,” the Ohio State men’s basketball team did just that. 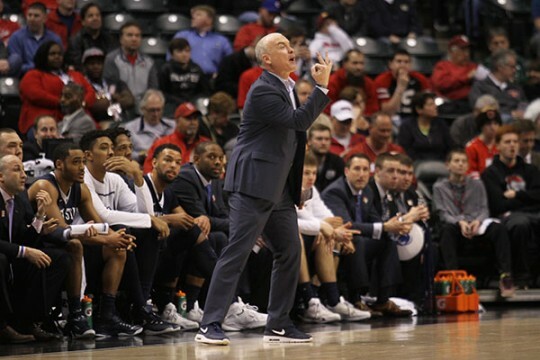 The seventh-seeded Buckeyes (20-12, 11-7) found themselves in a dogfight heading into the final few minutes, but they did just enough to outlast the 10th-seeded Penn State Nittany Lions (16-16, 7-11) by a 79-75 score to move on to the Big Ten quarterfinals against second-seeded Michigan State. “We got this one out of the way, we got what we came for, but we didn’t play as well as we wanted to,” said OSU coach Thad Matta. OSU scored 54 of the final 94 points to withstand an early Penn State shooting barrage and grab the victory. Junior forward Marc Loving came up big for the Buckeyes with 24 points, while freshman guard JaQuan Lyle contributed 22 points, 10 rebounds and five assists. Trailing by as many as 10 points in the first half, the Buckeyes clamped down defensively in a big way, holding Penn State to just 37.5 percent shooting over the final 20 minutes. Only one of OSU’s first eight shot attempts were from 3-point range. The Buckeyes made it a point of emphasis to go inside early, with their starting center, redshirt sophomore Trevor Thompson, taking four shot attempts in the early minutes. He hit only one of them, as OSU went into the first timeout trailing 10-8. Still, OSU did not give up on its attempts to use its height advantage to take care of the Nittany Lions and eventually found some results, including a stretch of four straight successful field goals. While the Buckeyes climbed toward 50 percent shooting on the inside, however, Penn State could not miss from further away. A 10-0 run, accentuated by a 3-pointer from senior forward Brandon Taylor — his third of the half — pushed the Nittany Lions ahead 25-18. Penn State began the game 7-of-11 from 3-point territory, while OSU did not hit its first outside shot until the 1:31 mark in the first half on its fifth attempt. “Penn State, those guys were fighting for their lives, and (Chambers) did an incredible job,” Matta said. Things did not get any better for the Scarlet and Gray later in the first half when those inside shots, which for a brief time were dropping, ceased to do so. OSU went on a 2-of-9 stretch, during which time Penn State hit four more triples to help open up a 35-25 lead with four minutes left before the break. However, with the help of seven free throws — of which OSU hit four — and a transition layup over the next two minutes, the Buckeyes cut the deficit to four points. 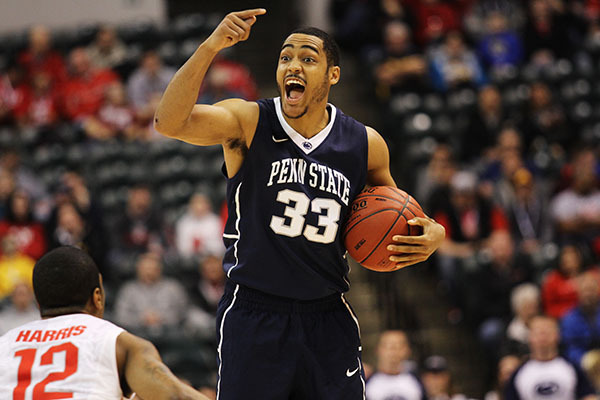 A 3-pointer by junior forward Marc Loving then cut it to one, but Penn State snapped OSU’s 9-0 run with a jumper. A few OSU jump shots fell by the wayside before the horn, sending the teams into the locker rooms with a 37-34 Penn State lead. Penn State shot 52 percent in the first half to OSU’s 35 percent, but the Buckeyes’ 17-5 lead in free-throw attempts was a major reason for the three-point margin. 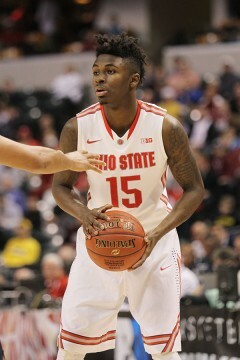 OSU also led 20-10 in points in the paint, though Loving, mostly an outside threat, led the first half with 13 points. Taylor and sophomore guard Shep Garner each had 12 for the Nittany Lions. 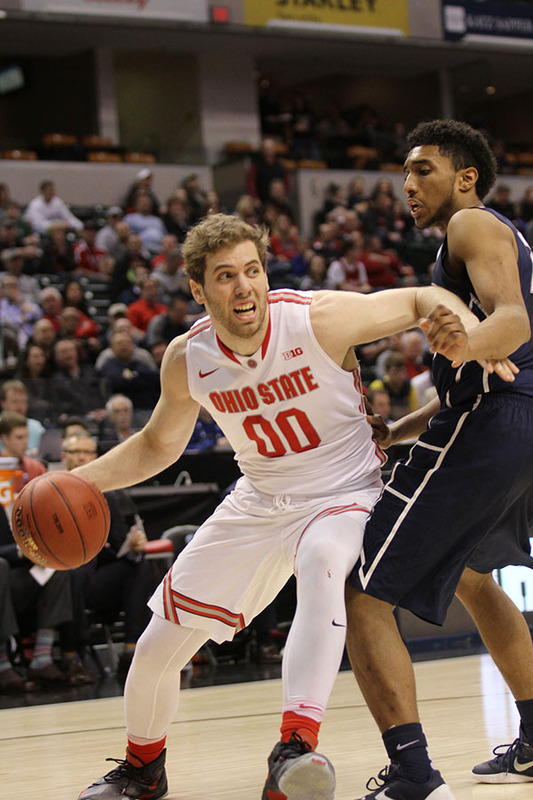 The higher-seeded Buckeyes wasted no time showing they were not going down lightly despite the halftime deficit. 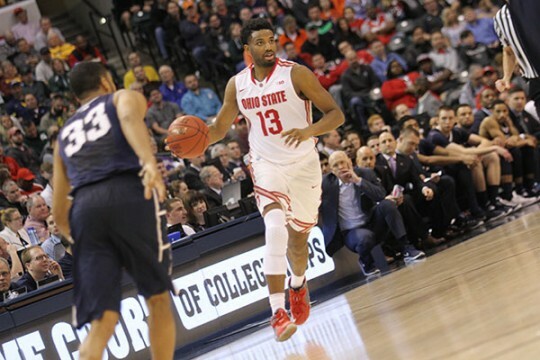 A layup plus a foul by freshman guard JaQuan Lyle cut Penn State’s lead back to two points after a Taylor jumper, then a 3-pointer by Loving put the Buckeyes ahead. Two free throws followed, then Loving connected again from the outside, giving OSU a 45-39 lead just three minutes into the second half. Another 3-pointer, this time by sophomore forward Keita Bates-Diop, gave OSU its largest lead of the game of nine points. At that point, however, Chambers’ squad snapped back into form, rattling off six straight points to keep the game in reach. The offenses flipped around from their first-half trends, as the basket closest to Penn State’s bench remained the one where the bulk of the efficient scoring happened. OSU hit seven of its first 11 shots in the second half, while Penn State, which was 7-of-12 from deep in the first half, missed its first six attempts from outside. It finished the second half just 2-of-10 from downtown. Still, Garner was quick to dismiss OSU’s zone defense in the second half, instead chalking it up to his team simply not connecting on its looks. Regardless, the Nittany Lions kept the score close despite the offensive discrepancies, just as OSU did in the first half. At the halfway point of the second stanza, the scores were four points apart at 56-52 in favor of the Buckeyes. And so the teams kept matching each other over the next several minutes. When OSU scored, Penn State answered. 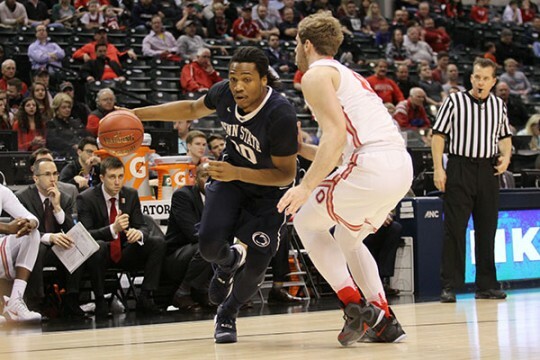 When the Nittany Lions went cold, the Buckeyes were unable to take advantage. Little by little though, Penn State grinded the score tighter and tighter, until a pair of free throws by Garner gave the Nittany Lions their first lead since the 18:11 mark in the half. Loving split a pair of free throws to knot the game up at 67, giving the fans of both teams at the Bankers Life Fieldhouse a cue to buckle up for the final few minutes. However, that wild ride quickly turned into a pleasant cruise for the Scarlet and Gray faithful, as OSU scored nine of the next 12 points to snag the second-round win. 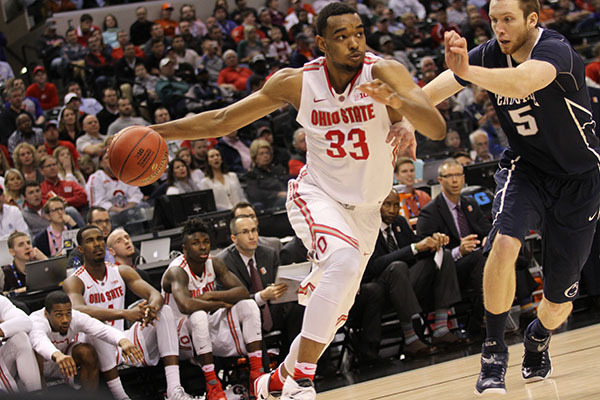 “We got some stops down the stretch, then made our free throws,” Matta said. Garner, Taylor and senior forward Donovon Jack did much of the heavy lifting for the Nittany Lions, scoring all but 18 of their points. Garner led the charge with 25. OSU’s reward for the victory is a quarterfinal matchup with Michigan State, which easily handled the Buckeyes twice in the last few weeks. Tipoff is scheduled for 6:30 p.m. on Friday.